Winter retreats at Red Clay are weekend intensive skill sharing sessions. They are intended to build both individual practice and a sense of connection, community and friendship within each discipline. All participants are expected to contribute to meals during the retreat and to keeping the place clean and organized. A fee is charged to help with upkeep of the facility and basic supplies. Drawing retreats will be held the last weekend of each month from January to April. 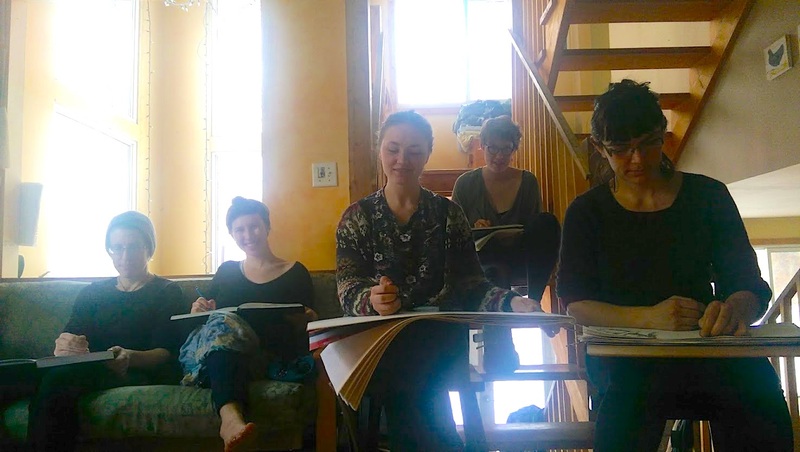 The Red Clay Drawing Retreat is an intensive weekend of drawing in a beautiful solar house and property in rural Nova Scotia. Artists collectively prepare meals, draw and work together, participating in 10 life-drawing sessions throughout the weekend. The February 22 drawing retreat will be a mixed life drawing and sculpture (clay) session. To facilitate this Saturday sessions will be longer poses to accommodate sculpture. If you are interested, please join Red Clay Drawing on facebook. You can email redclaydrawing@gmail.com if you have questions or to register. Red Clay is located in Nova Scotia on the shore of the Bay of Fundy (50 km west of Truro on route #2).